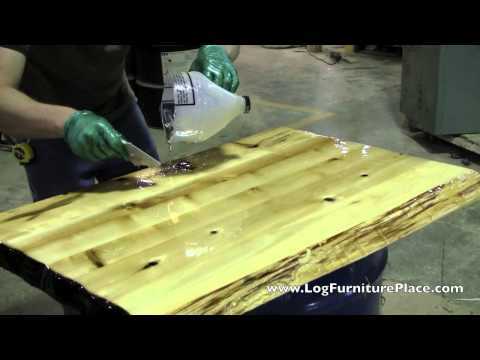 Jason and Dave with JHE's www.LogFurniturePlace.com show how the liquid glass 2 part epoxy is applied to our Cedar Lake collection of log bathroom vanities and log dining tables. The liquid glass is an application that will protect the wood beneath as well as provide a very glossy finished look - the look of wet glass. We also offer our liquid glass finish on our log coffee tables, rustic end tables and log sofa tables. Come shop at www.LogFurniturePlace.com to find only the highest quality of cabin furniture.